One of the easiest and cheapest ways to update a yard or patio for spring is to makeover outdoor furniture. 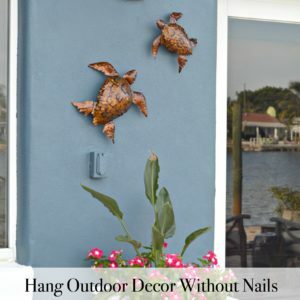 I’m going to share with you how to spray paint metal outdoor furniture to last a long time. It’s an easy one afternoon project that anyone can tackle and following a few simple steps has everything to do with how well your outdoor furniture makeover holds up over time. It’s feeling like spring already around here. The days are getting longer, we have bright blue skies, and the temperatures have been perfect for outdoor activities. This is about the time of year where I start dreaming of all kinds of outdoor DIY projects to spruce up the yard. Do you get like that too when the weather starts getting nice? If so, my how to spray paint metal outdoor furniture tutorial is a great way to welcome spring with cheery colors and best of all, it can be done in an afternoon! Supplies to spray paint metal outdoor furniture. TSP, trisodium phosphate, I use the powder and it lasts a long time. spray paint handle, this is a huge hand saver if you have a big job! Prepare your outdoor furniture for painting by first washing it with TSP and a scrub brush to remove any dirt buildup or grease from the metal. When it’s dry, you’ll remove as much rust as you can. Take the wire brush, and briskly run it across any area on your metal outdoor furniture frame that has rust. The idea is to knock off as much rust as possible, especially any loose or caked on rust. Pay extra attention to corners and tight spots. It was hard to imagine this set being pretty in the state it was in! Next you’ll start priming. 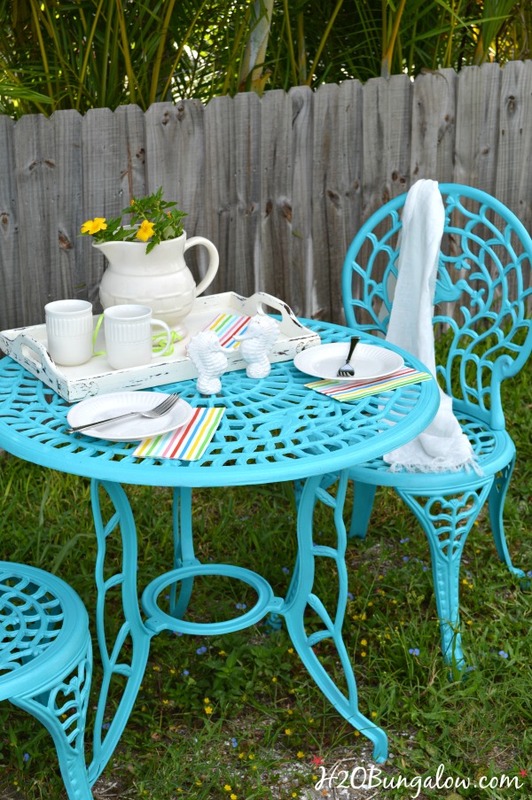 Lay your metal outdoor furniture on your drop cloth and spray with the Rustoleum primer. Apply light coats and let dry thoroughly between each cost before moving on to the next area to spray paint. 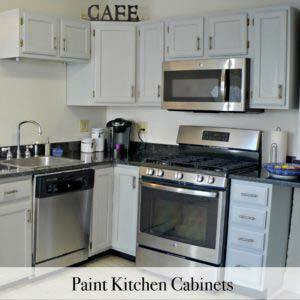 Follow the same steps with the Rustoleum enamel spray paint. Again, light coats are best to avoid paint drips. 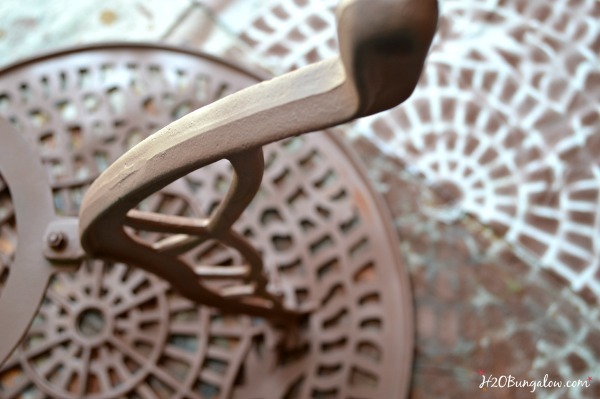 Spray painting your outdoor furniture from several angles will help get an even coat all over. I feel that people don’t realize how easy it is to do a DIY project like this until someone shares a few simple steps. 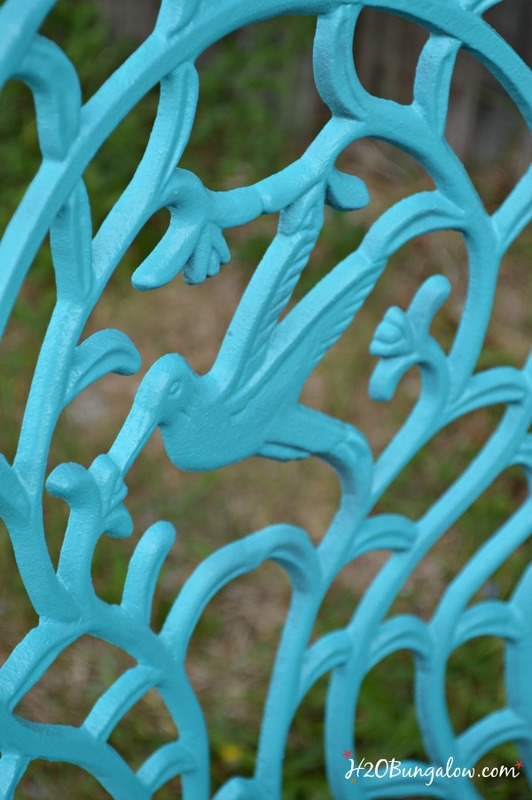 How to spray paint metal outdoor furniture to last is an afternoon project that can be enjoyed for a long time. Adding bright color to your yard to welcome spring just might have you thinking about other ways to add DIY seasonal color too. Like maybe a DIY colorful doormat to brighten up your front entry, or begin making mixed front door planters . Is it feeling like spring in your area yet? Would this work on a metal swing set that is rusting ? Amazing turnout of your project, love the color!! Hi Lisa and yes it would. I have a composter with a rusty frame I getting ready to redo…well I won’t paint it turquoise. 🙂 Follow the the steps and use whatever paint color you like and it should work just fine. Good luck! 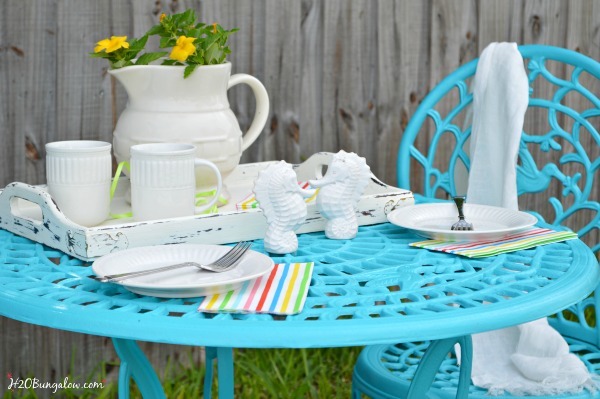 How many cans of turquoise (seaside) paint did you use? I have a similar set. It is new and black, so I figured I will prime it first and then put on the paint. Hi Evie, That’s a good question. It’s been a while since I did this project. I’m thinking about two. Read the paint can instructions, you may not need primer. Especially if your set is new and has no rust on it like mine did. Also, using a quality paint makes a huge difference in the coverage. I’ve always regretted trying cheap spray paint. 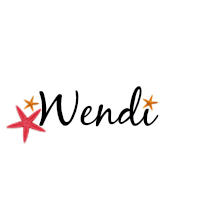 Good luck and have fun with your project! Love coming here to exchange ideas! Just found this as I debate painting my outdoor chairs before winter hits as they will be spending the fall and winter inside my glass enclosed 3 season room. Its a new (to us) house and I am doing turquoise as our accent color all through out so this is perfect! I just got new cushions on clearance (one advantage to this late project. The one question is I have is should a clear coat go over to help protect the finish even more or is that overkill? Our 3 season room has screens that will probably all be put up next year so in bad rains they might still get a little wet but won’t usually be exposed to the weather like that. Of course every room in this house needs a makeover but sometimes a little project like this gives you a boost since it’s easy to finish. Hi Laura, You should be fine without a topcoat as long as you use a paint that’s good for indoor/outdoor use like the Rustoleum line. You’re using one of my favorite colors 🙂 Smart getting your cushions on sale, I’m sure your room is going to look beautiful and be comfortable for the fall/winter as well. It does help to have one area pretty and decorated when there’s much more to do. We had that same challenge here in our home since it took almost 3 years to get most of it done. We still have a big to do list! Have fun with your project and thanks for your visit! I love this makeover. I found a similar set on Craigslist. It needs a fresh coat of paint, so you tips are perfect. I’ll be pinning your post on my DIY Board. 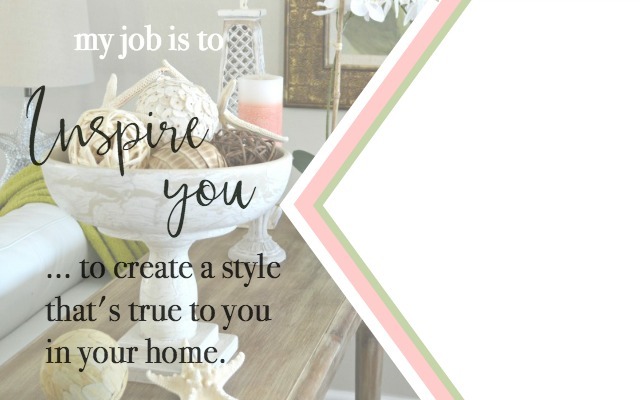 Please stop by and share your inspiration on my Sunday’s Best Linkup. Great way to expose your blog and inspire other bloggers. Hi Rhonda and thank you! Sounds like you found a deal:) Painting outdoor furniture the right way so it lasts is a time saver:) Have fun with your set and thanks for your visit! This table & chair set looks fabulous!! I love the color and it is perfect for sitting outside and soaking in the sun! 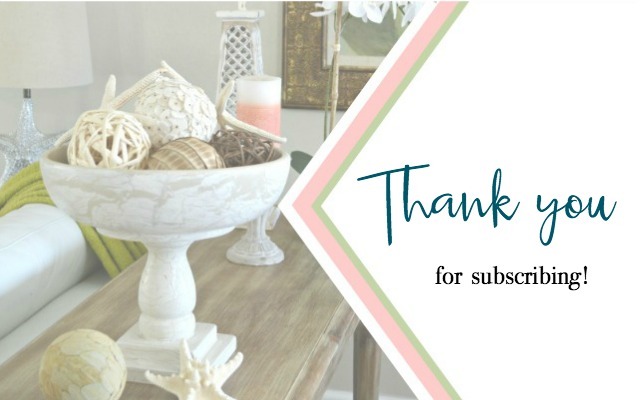 Thanks for sharing your tips and linking up with us over at the Welcome Home Wednesdays Link Party! Hi Lisa and thank you! This color is so dreamy I can’t believe it came out of a spray can! I enjoy your party, thanks for all your hard work in hosting! Amazing transformation! I love the bright blue color, it looks so cheery. Just what I needed to know. Thanks for sharing! I am so glad that you posted this! I have a patio set that has peeling paint and I was wondering how to re-do it. I will definitely be pinning this and doing it soon! Also, I LOVE the aqua! Hi Randi! This is such an easy project to do and so worth it since it will last. Have fun with your project and thanks so much for your visit. Thank you for the tips! I get so tired of having to respray my furniture every year. Sherry, I know what you mean and it’s frustrating to say the least! 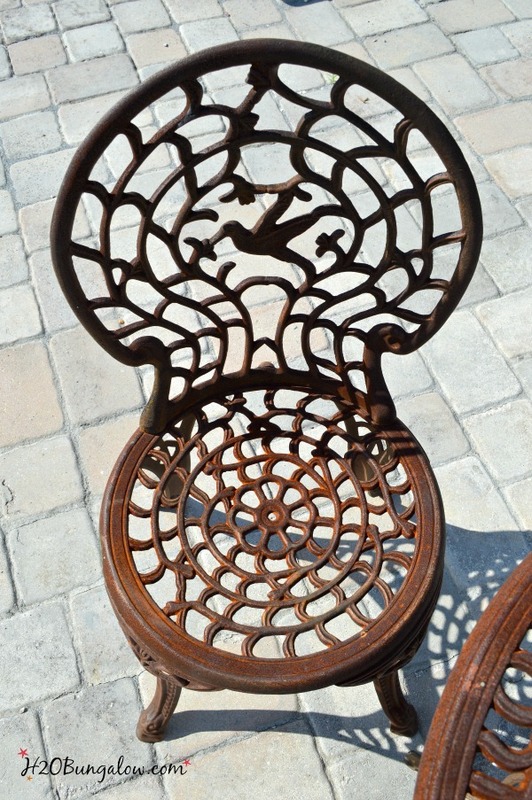 So glad you liked the tips, your outdoor furniture will look better much longer with them. Thanks for your visit. I love that color! Is it this one? Turquiose? Hi Becky – So sorry I was slow to respond! I’m still catching up from attending a bloggers conference last week. Yes that is the color. Isn’t it the perfect blue? Thanks so much for your visit & good luck on your makeover! I wish our temps here in Ohio were warming up! Your beautiful patio set makes me want to spend an afternoon outside with a good book and a glass of lemonade! 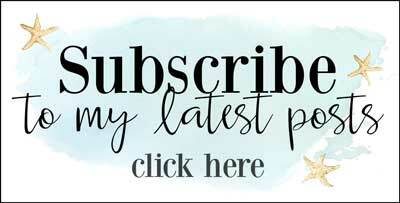 Thanks for linking up with Merry Monday – I already pinned your post and will share on FB! I love the color you chose! I have a green set that is starting to chip…I may have to give it an update this spring! Wendi, it’s gorgeous! I love that blue. 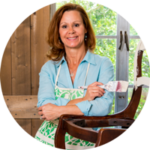 Thanks for sharing your tips for painting metal furniture. Thank you Bonnie! This shade of blue is really spectacular! So glad my tips are helpful, it makes such a difference to get a good paint job on outdoor furniture! This is so pretty! Thanks for all the great tips! So fresh in that gorgeous color and you styled it beautifully! Enjoy! Have a great week! Wendi I also have metal outdoor furniture and I use a product that combines anti rust primer and paint all in one. I’ll have to be on the lookout to see how it will hold up. Do you think it’s really necessary to use the primer? Btw, I love the color you chose. Hi Mary, That’s a good point and I think it’s OK if the piece isn’t too rusty. The one I had was very rusty, so I wanted something to stop the rust chemical reaction. I’m always conservative since we #1 live in the salty air which even corodes interior light fixtures:( and #2 I hate to redo projects. So I don’t mind the extra few dollars and step to be sure I’ll have lasting results. That was a really good question & I’m sure someone else will have it too. Thanks for asking it! & Yes.. I LOVE the turquiose! Beautiful transformation Wendi! gotta love paint! 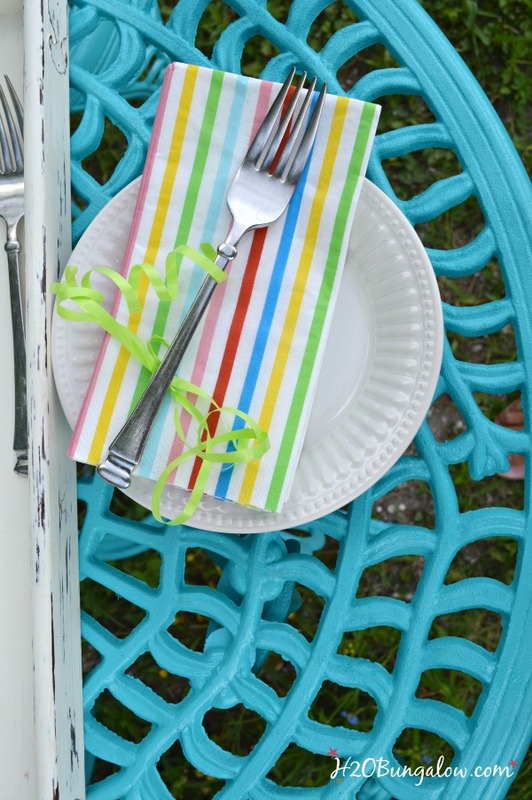 pinned your lovely outdoor furniture! Hi Gail & Thank you! I love the new look, and yes…paint is magic! Your little table and chairs look so pretty, sure makes me wish I was living back in Florida again. I’m afraid it will be awhile before we see spring around here. Hi Christina, Patience pays off especially when painting furniture! You wouldn’t enjoy a drippy hot mess of a table. If you’re like me, that would be the first thing your eyes would travel to every time you sat at the table;) ..& yes, loving the spring feeling! Wow, ! love the turquoise. I know what you mean about getting antsy to start outdoor projects, good to see somebody else is starting to get ready for spring. We’re still in snow here so your pictures have me getting anxious. Thanks for sharing your gorgeous project! Hi Sue, I was wondering if it was too early to share a spring project, I forget a lot of the US still has snow. Spring is one of the best seasons here and I get excited when the days get longer and warm:) So glad you liked my turquoise makeover & thanks for your visit! I have a lot of experience in painting metal furniture. I agree it looks great when finished! However, your article addresses the lasting longer aspect. That statement is contrary to my findings. Just for fun, take pictures next year after being stored. Every piece I’ve done even after doing the exact steps you describe had to be redone. I’m looking for real lasting results. Hi Susan, It’s tough to figure out why some items last longer than others. Especially when there are so many variables like weather, salt air, the type of metal or even how well prepped and sealed a furniture piece it=s before painting. Maybe adding a few coats of a clear sealer will help. 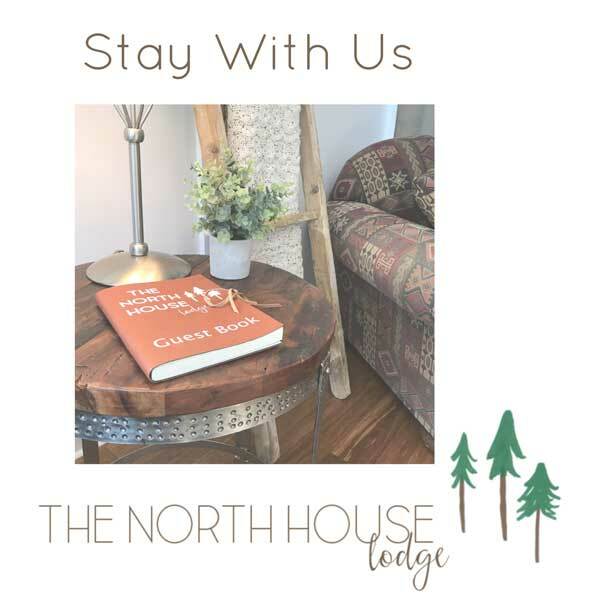 Thanks so much for your visit & note! Hi Sharon, I swear by TSP for prepping all my makeovers. It’s a lot less messy if you make it in a spray bottle. Spray it on and wipe it down with a rag. I clean a lot of my furniture makeovers like this too. Way less messy! Thanks for your visit and please share a pic of your makeover on my H2OBungalow facebook page when you finish it! I pinned. It looks lovely!